This recipe is the property of Jazzy_girl and released under the CC Attribution-NonCommercial-NoDerivatives 4.0 license. You may not copy, derive or commercialize this recipe without following the terms of this license or the explicit permission of the creator. 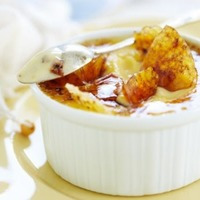 A robust vanilla bean Creme Brulee with a touch of spices. I love the CDS here. It’s used minimally and imparts a subtle cinnamon spice that matches up so well with not only the Creme Brulee but also the Vanilla Bean. The FLV-centric custard base is smooth, creamy, and rich without being too ridiculously unctuous or thick. This made its way into one of my squonkers, and I had a tough time letting go when it was gone. Thanks for sharing this one, Jazzy! Super smooth and creamy delicious vanilla custard with a lovely dry sugary caramel and cinnamon top note. It tastes wonderful; my only beef with it, if you even want to tall it beef, is prominence of the cinnamon with no cinnamon in the name or description. My best guess is that the cinnamon is supposed to give the vanilla bean a bit more of spicy kick, but it’s coming through pretty clearly as a cinnamon + vanilla rather than just spicy vanilla bean. If that’s what’s supposed to happen, it needs less cinnamon. But putting cinnamon in the name or at least description would work just as well because it’s already super tasty. The custard is a little loose and creamy and not as much of a thick and eggy custard, but it’s not always a bad thing, it keeps it from getting too rich to vape all day.